Intro: Introduce Hero and ordinary world. Inciting Incident: A problem disrupts the Hero's life that will kick off the rest of the story. Immediate Reaction: The Hero deals with the inciting incident and/or the changes that result from the inciting incident. Reaction: Long-term reaction. The reader begins to understand just how the inciting incident will affect the Hero's life. Action: The Hero decides to act and makes a decision that will impact the rest of the story. Consequence: The result of the decision made (see Action). Pressure: The Hero begins to feel the pressure of the task before them and is stressed. Pinch: Things get a little more complicated and the Hero wonders if the right decision was made. (see Action) A plot twist happens. Push: The Hero is pushed in a new direction. New World: The Hero experiences a new world or situation. Fun & Games: The Hero explores and interacts in the new world. This is a good place to build relationships, romantic or otherwise, and develop your character more. Old Contrast: The Hero compares the new world to the old, and is reminded of how much has changed. Build Up: This is where you prepare for the major turning point in your story. There is some form of struggle, internal or external, that will motivate your Hero to take matters into their own hands. Midpoint: The Hero encounters something that complicates their plans and motivates them to change the course of events. Reversal: Everything goes to hell. Dedication: The Hero is now determined to overcome the overall issue. Trials: The Hero finds a solution, but now must overcome doubt, or some other complication. Pinch: Plot Twist! Everything is worse than it was. Darkest Point: Everything seems lost. Power Within: The Hero finds the courage and the strength to carry on. Action: The Hero takes action, and overcomes the plot twist, before taking on the overall issue again. Converge: Everything comes together: the main plot, the subplot(s), the conflict, etc. The big event is imminent. Battle: The Hero fights the villain and/or tackles the overall issue full force. Climax: The Hero either triumphs or succumbs to a fatal flaw. Resolution: Tie up all loose ends. Make sure the Hero has changed in some way. And we're done! Phew! 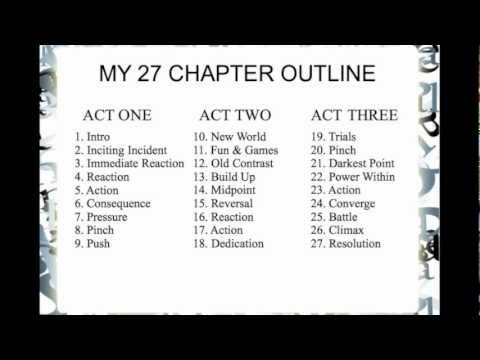 Now remember, this is just what I use to outline. If this doesn't work for you, it's okay. If it does help you in some way, that's awesome! Let me know if you've used this outlining structure in the past, and whether you liked it or not. Talk to you soon!